CASL, Canada’s Anti-Spam Law 6 Months Later: Is It Working? 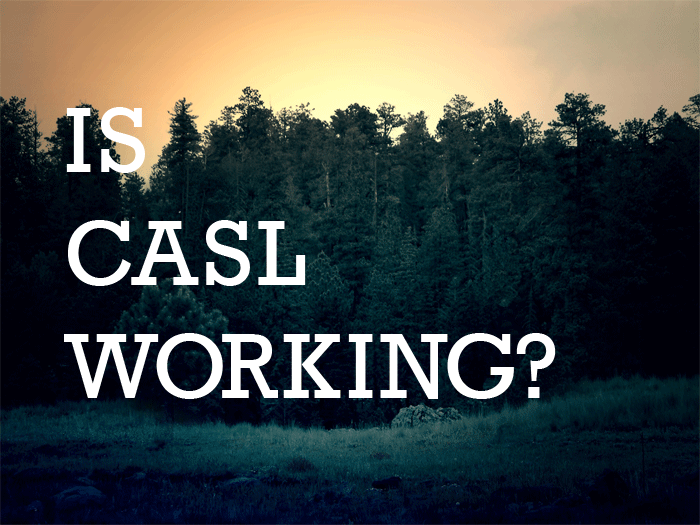 Q: Why does CASL matter and for whom does it matter? A: CASL matters to any marketer or individuals sending commercial electronic messages (CEMs) to Canadians, regardless of where they are sending email from. The Canadian Radio-television and Telecommunications Commission (CRTC), the Office of the Privacy Commissioner of Canada (OPC) and the Competition Bureau (CB) have all agreed to work with their intentional counterparts to investigate and enforce the appropriate portions of the legislation that are being violated. CASL also covers more than just CEMs. It also addresses the unwanted installation of computer programs and the interception or modification of data in transit. Q: What are the implications of CASL short term? Long term? A: CASL was implemented in July 2014, so the short-term implications are already passed and many people are waiting the results of the initial rounds of investigations from the enforcement agencies covering section 7 of the legislation (CEMs). The initial levels of work varied by marketer and ranged from various cosmetic changes on their website and message templates, to full reconfirmations of databases in efforts to properly capture consent and track the confirmations of the subscribers. Q: What has been the result of CASL since it was implemented in July or will we not really know until the two-year grace period ends? A: So far there has only been one public action that the CRTC has released information on that addressed a malware infected server that was identified to the owners Host/ISP which then helped the owner clean the infection. There was no fine under the legislation as a result of that infraction. However, it did show that the spam reporting center was able to identify high volume offenders and take action that stopped the further distribution of spam from this source. Q: Beyond email, is CASL having an effect on how marketers use SMS? A: As CASL covers all forms of CEMs, including SMS, marketers are feeling similar effects when dealing with SMS communications to subscribers. However, the proliferation of sending CEMs to individuals via SMS in Canada has had long standing practices towards consent based messaging in Canada as put forth by the Canadian Wireless Telecommunications Association (CWTA). Q: Are companies adhering to the law in Canada? In the U.S.? A: Canadian marketers are generally complying with the legislation. There are not many that are waiting to see what happens. As for U.S. marketers, many are taking action to understand CASL and how it will be enforced outside of Canada. Actions are ranging from directing Canadians to localized sites to doing nothing and not changing their current operations thinking that they are not going to be affected by CASL. Many are expressing concerns and reviewing the law to be sure they are aware of the law, but most of this seems to be driven by the ESP/email consulting community with some efforts from the larger marketing associations. Q: So people are taking it seriously? A: Yes, marketers are taking this very seriously. This is partly due to the potential fines of $1 million for an individual or $10 million for a company. Many people are also concerned about the Private Right of Action (PRA) portions of the legislation that will come into force on July 1, 2017. Q: What are some misconceptions around CASL? A: There are several misconceptions around CASL. I’ll be presenting a number of them on December 17th. I encourage people to listen in and learn about the misconceptions that way. Q: The law has some teeth in the form of penalties, but are those teeth going to get used? A: Yes the CRTC also manages the Do Not Call (DNC) list in Canada and they have actively given out fines under this legislation. My understanding is that they will be looking at enforcement of CASL in a similar manor, where smaller infractions will see smaller fines and larger or repeat offenses could see much larger or maximum fines applied. To learn more about CASL’s possible effect on your business and practices, tune in on the 17th to hear Matthew speak on the subject.